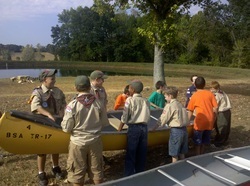 Webelos canoe race at Alamance Camporee 2010. Use the drop-down Photos menu to view pictures submitted to us from our different events. If you would like to share your pictures with us, then please bring them to your leader on a flash drive or CD. We would love to see them!